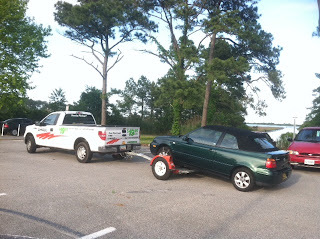 To get ready for the weekend I had to get our beach car to the Ocean city Maryland airport. Mary is still not up to a drive like that and Mike was out of town. I decided to rent a pick up truck from U-Haul along with a tow dolly. It was a smooth trip to and from Maryland. I got some drive time prep at work Thursday with a trip to/from cape may to set up my satellite office for my new contract. The ride to ocean city was uneventful and the ford did an awesome job towing the Cabrio. I got home from the drop off around 9:30pm and got the truck backed in the driveway and secured for the night. Mary and I got up early Friday and returned the rental. It was foggy and a ceiling of five hundred, slowing starting to lift. We made a stop at Angels for breakfast then headed to the airport. I'm ready, get the fan turning! 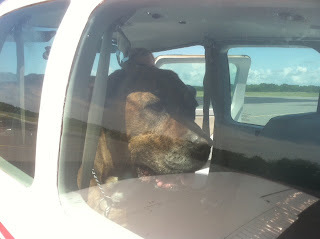 We packed the plane,including Maggie and climbed aboard. I called for my clearance and copied the following. 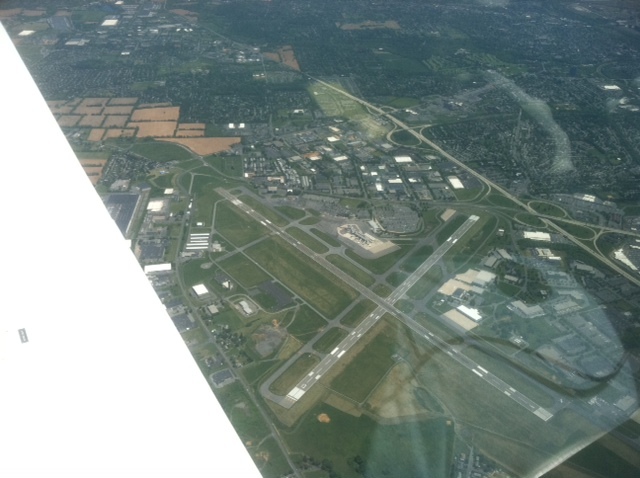 We launched off runway nine and Wilmington handed us off to Philly at 500 feet. The bottom of the layer was seven hundred feet and we were climbing through it. Philly cleared me to four thousand and a turn to 220* to join V29. The Garmin 530 was already activated on that leg (DQO ENO) so I was set to track. Once on top the sun was shining and the layer looked like cotton strung out below us. 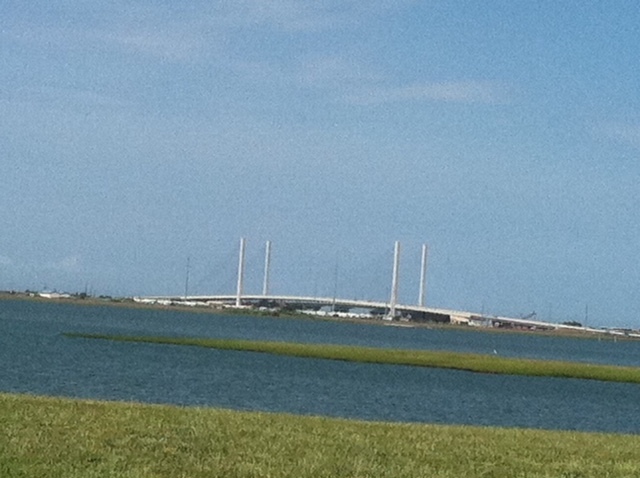 We enjoyed the ride as we were handed off to Dover and Patuxent. 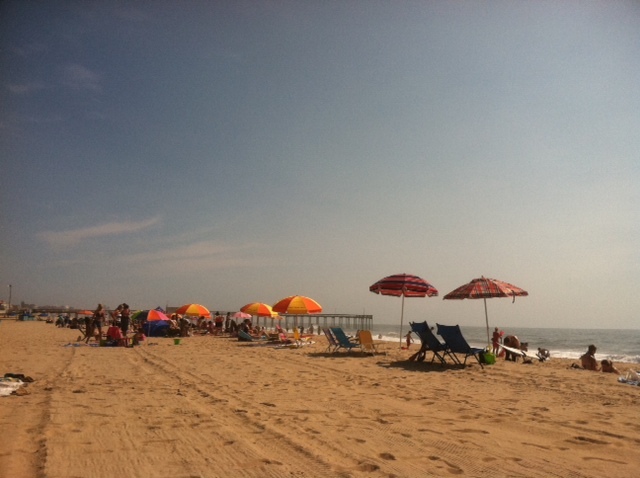 I advised pax that I had the wx at ocean city. Approach asked what approach I was looking for and I responded GPS RWY 32. I was told to expect GPS 32 at GOBYO. 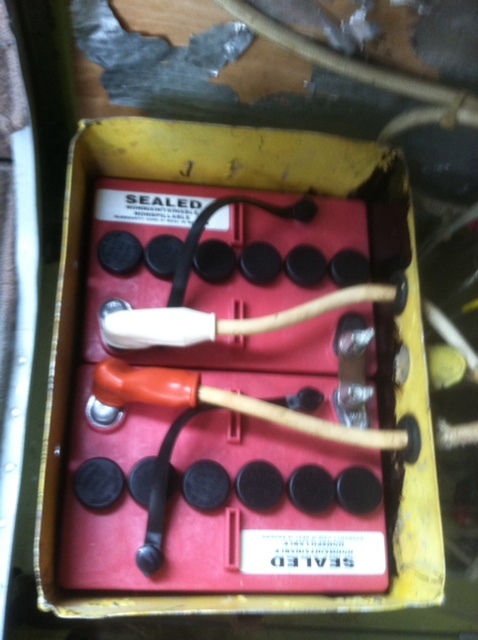 I loaded the approach but did not activate, I've learned approach changes and it's easier to chug and plug once. As we continued towards SBY patuxent gave me direct ocean city, expect vectors to GPS 32, this is why I didn't activate earlier. I continued to monitor the wx at OXB and it was now down to 400 feet. 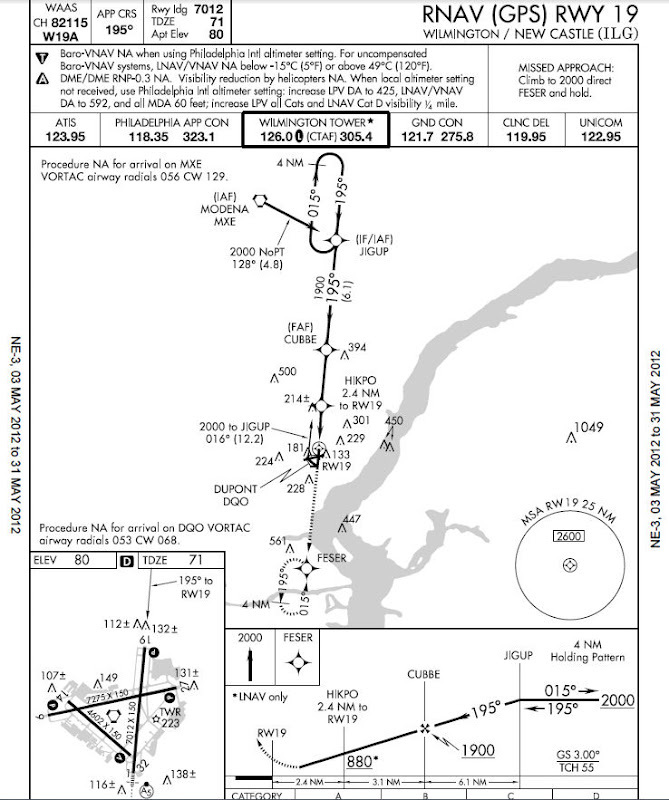 The MAP for GPS RWY 32 is 380' so this was going to be an attempt with the alternate of Salisbury looking better. I briefed the KSBY approaches just in case, and noted comm frequencies if needed when I go missed. It's all about staying ahead of the plane. I worked my way to OXB and heard another aircraft ask for the GPS 02 approach into OXB. Hmmmmm.....that runway has been closed. Approach quickly advised the same followed by the pilot advising he will circle to land. Yeah right, not with that overcast layer, circle to land is 480 feet. I get sent to a hold so that pilot, who now asked for GPS 32, can continue in. I had to fly into a building layer that kicked us around a bit but it was doable. Direct PFAIR hold North West as published, at 4000, I acknowledged. 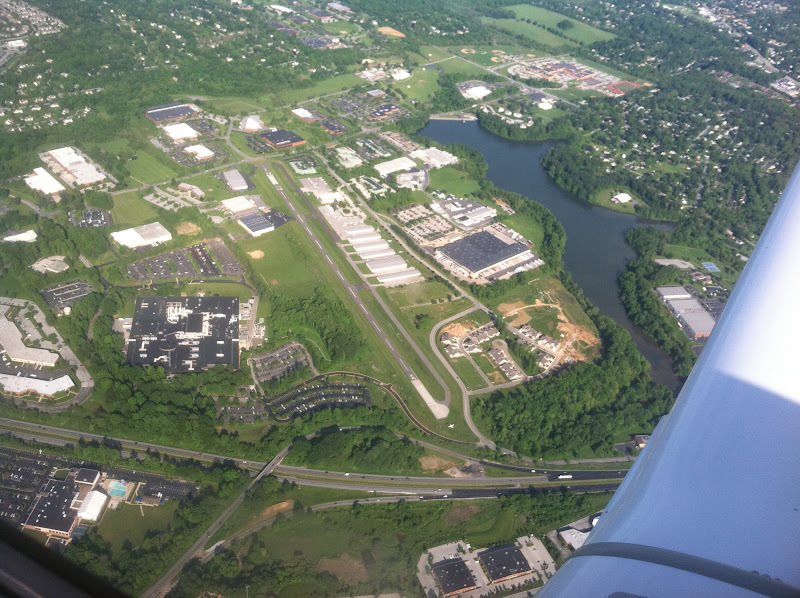 I entered the hold direct at PFAIR, advised approach and was turning outbound on the 325* radial for four miles. With my turn inbound I was watching the clock for my, "expect further clearance time" (EFC). I heard the previous aircraft cancel so approach turned me to 180* for vectors to the GPS approach. As I turned south I flew out of that layer and had a clear view from PFAIR to the Ocean. I also canceled IFR. I entered the traffic patten on a three to four mile forty-five for three two and followed with a smooth landing. Saturday was an early start since Maggie managed to stick that big block head of hers under the covers and licked my foot,really really gross! Ok, Ok, time to get up and feed the beast then do the morning walk. Mary and I decided on bagels from Dunkin and we were out the door packed for the beach. 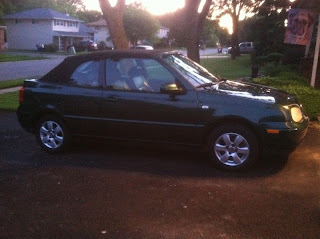 The Cabrio ran great and it was fun to be cruising like two teenagers with the tunes playing and us having a blast. I guess we spent three hours or so broiling in the sun before we decided to pack up and head back to the motor home. Neither of us felt like cooking so we decided to try this little dive looking place just outside our RV park. The Grove Market was busy if one was judging from the parking lot. We parked out front and figured we would give this place a try. When we walked in we asked for a table for two and I was asked if we had reservations. I know we gave that you got to be kidding look (because we judged the book by the cover). He said you must have reservations and its best to call three to four days in advance. Ok, just so we know do you accept credit cards, his reply, no, bring your piggy bank. Not a problem, thanks for the info and out we went. We decided on Italian but when we passed Watermans Seafood the car just turned in. 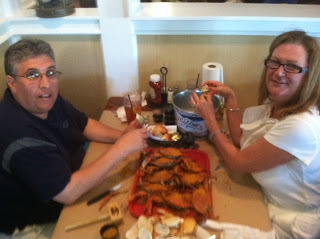 We quickly decided on a dozen large crabs with crab dip and some cold drinks. Watermans - Steaming hot crabs!! Sunday was a sleep in day and Maggie obliged. We didn't get motivated in time to make the beach but we did schedule a lunch meet up with my sister Denise and her husband Dave. Denise and Dave have a place in Pine Tree, located in Ocean View Delaware. It was maybe a 45 minute ride and despite a buzzard taking off from road kill pickings in the next lane and clipping our windshield with wing feathers coming over the top and just missing Mary we had fun. It really was a fun time catching up and seeing where they were located. 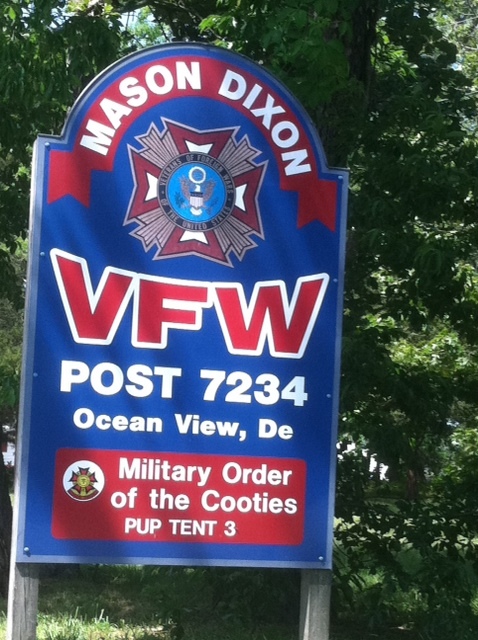 Military order of WHAT ??? Dave drove us around after lunch at an Italian restaurant so we could see the sights. 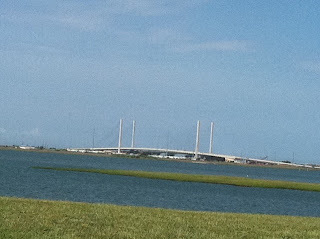 I did manage a picture of the Indian River inlet bridge from the VFW post parking lot. 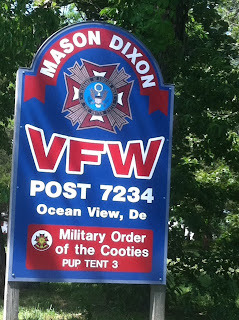 I also had to take a shot of the VFW post entrance sign. We headed south for the rig and called it an early night. We hung out next to our fire pit (I fogot to bring firewood) and chatted with our neighbors that all gathered to chat about our dogs. Today was another early start for the beach. I decided to take a different route so we didn't get caught up in the mass exodus traffic after check out. Instead we followed RT50 making a stop at PetCo for Maggie stuff and enjoying the view. 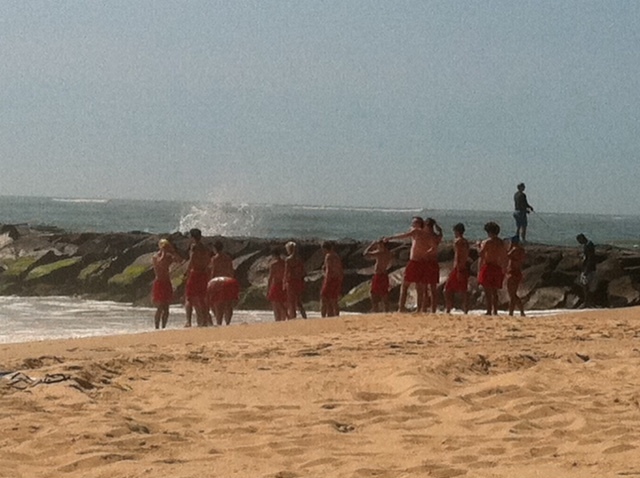 The beach wasn't to crowded as we surveyed the sand and crashing waves for that perfect view. I guess we spent three hours under some clouds but Mary and I managed some new red on our faces and legs. We packed up and headed back to the rig so we could bug out north before any chance of thunder boomers invade home in Wilmington. I secured the rig and we loaded the car including the beast Maggie. As we approached the airport turn off (turn lane) a lady in an explorer pulled out of the road we were going to turn into. She crossed the double yellow and accelerated right at us. I blew the horn and came to a screeching stop since I was not able to clear the turn lane with traffic coming by our right side. The lady swerved back to her side of the double yellow and my Bride started to breath again. Fun stuff right before I fly. The flight home was uneventful! 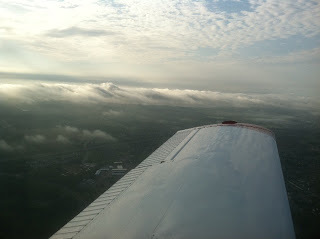 Bumpy at times since I was lazy and didn't pick up my clearance, instead flying home VFR at 3000 under the clouds. 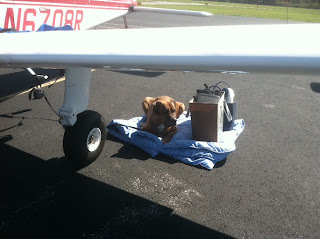 Maggie was warm in the back even with four overhead vents blowing on her, it was 75* at altitude. Mary passed out and I took a nap.....no, just kidding, I flew the plane, jamming to some 70's rock while I listened to Dover Approach for traffic. A bit of a long landing but a smooth one, we were home. 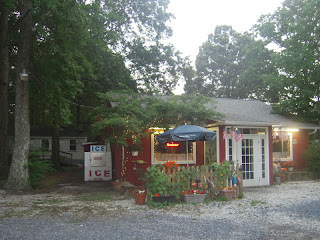 I made a stop on our way home for ice cream and even Maggie had the kids cup soft ice cream. I finally got the chance to meet up with Jack after an arranged meeting through my friend Steve. 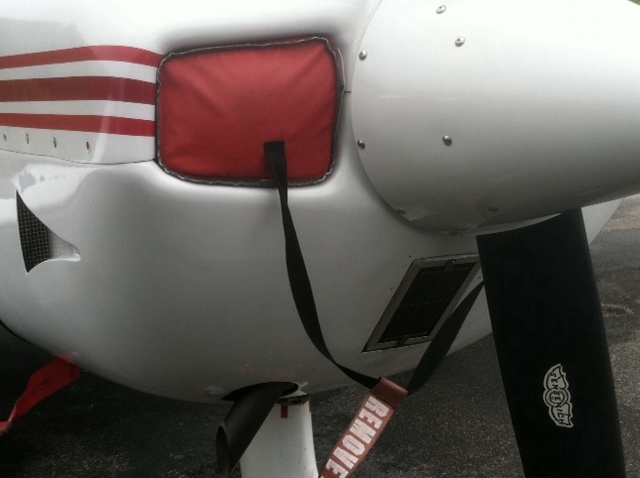 Jack is an instrument rated fixed wing and instrument rated helicopter pilot. 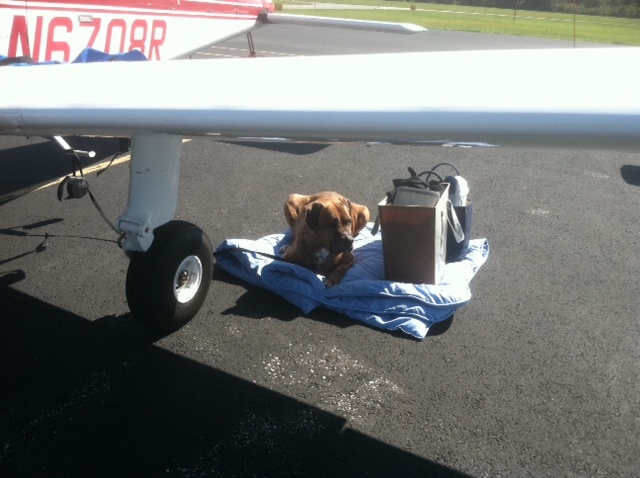 Jack hasn't flown in a few years and has let his medical lapse. At one time he had a cardinal, often making the trip to Florida, so yes, he's the real deal. Former military service in his background and just a really nice guy. 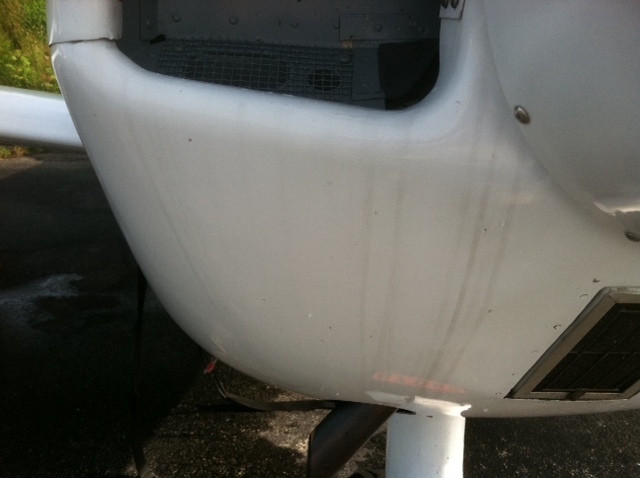 We pre-flighted 08Romeo and got the fan turning. The plan was to head south VFR to Georgetown. 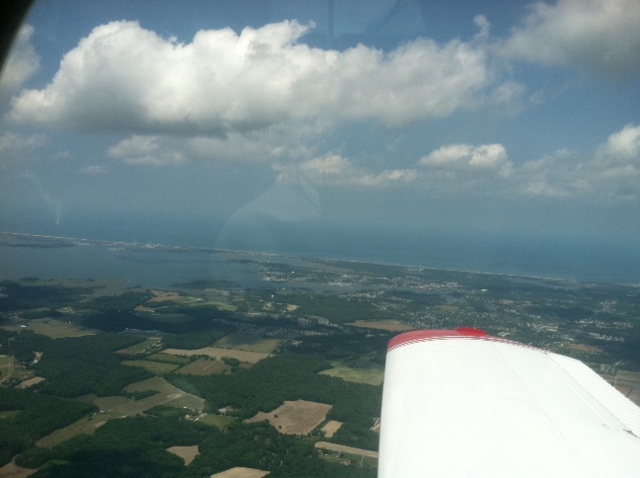 We launched out of Wilmington and soon picked up flight following with Dover. I offered Jack the controls and without hesitation he moved his seat forward, checked rudder controls and acknowledged my plane. I confirmed your plane and went back to my radio work with Dover. It may have been a few years since he was flying fixed wing but Jack sure didn't miss a beat. 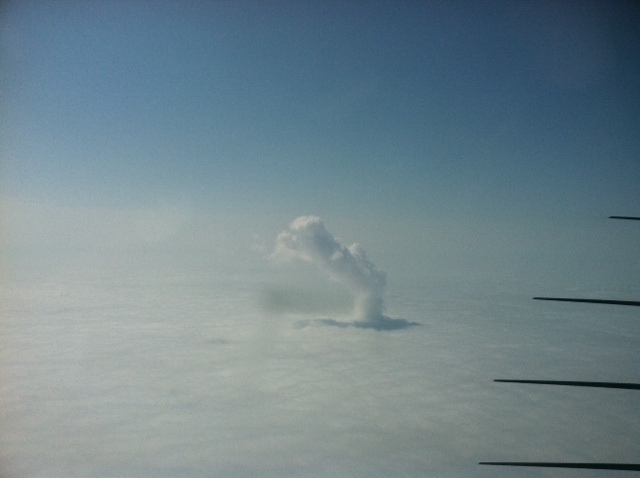 The cloud layer was starting to squeeze us lower and with a call to Dover we began our descent to maintain cloud clearence. We started at three thousand and by the time I dropped flight following and made my ten mile call to Georgetown we were at two thousand. We swapped controls maybe five miles out and I set us up for our landing. With the gusty winds 08Romeo did move a round a bit but settled in nicely as she finally quit flying and the mains touched down. 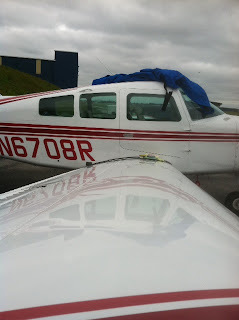 We taxied in and secured the plane noting we were the only ones on the ramp. The rest of the breakfast bunch wandered in and joined us as we were finishing up. It was good airplane talk (hangar flying)and I think Jack enjoyed the group. Conditions never did get much better and the ceiling was sitting at 13-1500. We all said our goodbyes and headed out to our planes. I decided to file with my iPhone and as long as Jack was ok with it, get some instrument time in. I picked up my clearance with Dover after my run up and advised number one for departure. 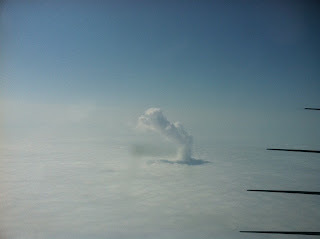 We were soon launching followed by getting into the clouds at 1300. Dover gave us direct Waterloo (ATR VOR), climb to 3000, upon reaching 1700 direct Wilmington. I acknowledged and was on instruments. I did sneak a few peaks at Jack and I think he was really loving the clouds and light misty rain. We finally broke out north of Dover and I acknowledged ground contact just before Jack advised the Delaware coastline in sight. The wx cleared but the winds picked up. Now in the clear I asked if Jack wanted more stick time. Once again we transferred control and Jack took us to the 3 mile right base for runway nine as Wilmington tower directed. I set 08Romeo down on runway nine despite the gusty winds, they were mostly down the runway. Thanks Jack for a great time! I am looking forward to you flying as my safety pilot. Despite your claims of being rusty you sure had smooth stick and rudder skills. Also, THANKS for breakfast, I got the next round. Mary and I started out the day making our initial visit to IHOP. Breakfast was pretty good and we were set for our annual trip north to Wilkes-Barre, PA. 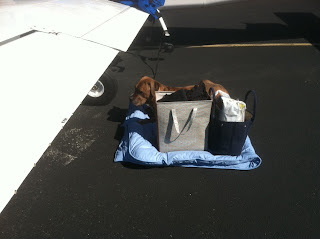 It was fun to finally pre-flight with my Bride, I've missed her company and help she provides when we fly. I think she's getting a pretty good deal "meeting" me at the airport for our beach runs. We saddled up and taxied for departure, IFR release noted and ready to launch. 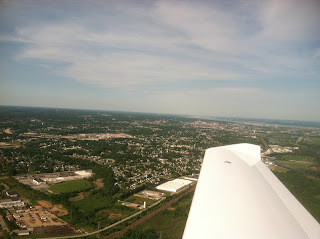 It was a very smooth flight with some changes to the plan by Philly but nothing major. 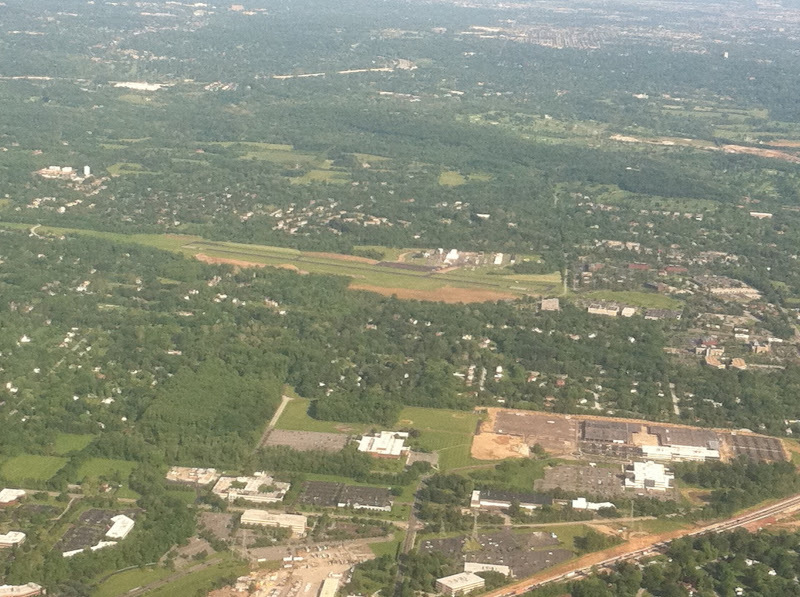 Actually a few short cuts that had me direct FJC (Allentown VOR) then Allentown approach gave me direct Wilkes-Barre. 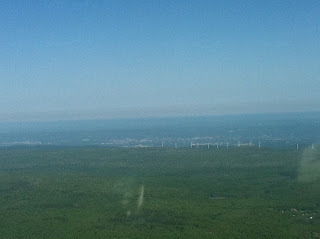 I had some concerns when Allentown stepped me down early to four thousand but it was pretty smooth of the mountains. I taxied to Saker Aviation and secured the courtesy van. I did take on some fuel as a thank you since I think it's the right thing to do. No, I don't know what the per gallon price was and I rather just pay the bill rather than suffer knowing. We headed over to the cemetery and cleaned things up a bit along with placing flowers and mulch. Everything will look nice for memorial day. It's hard to explain, let's just leave it at it's a family thing. I should add I enjoy doing this for my parents, it gives me time to chat with them, yes some may think I'm nuts but who really cares. It was a quick trip today and back to the FBO to turn in the van. 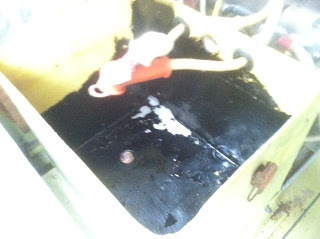 I did stop and refill the fuel, another thing that people should do. The IFR plan I had filed expired so I made the flight to KLOM VFR. 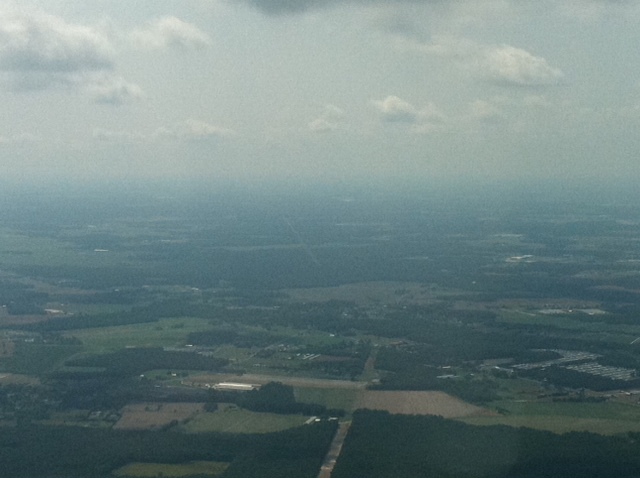 Wilkes Tower gave me a squawk code and we were on our way, headed to the Wings Fly-B-Q. 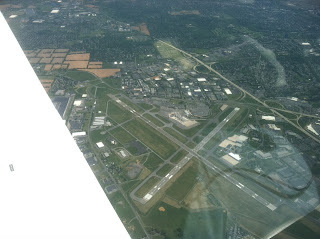 I joined the pattern behind a Cirrus and made a nice landing on runway six. 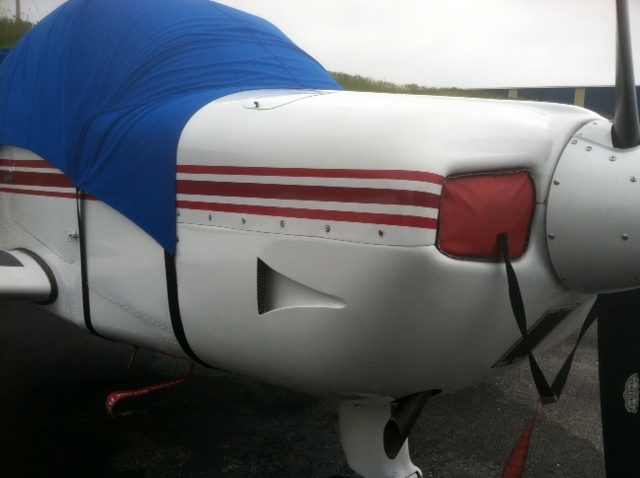 We taxied in and I took on fuel, why not at $5.69 special rate for fly in folks. Mary and I got to spend time chatting with friends and catching up on whats been happening. We all decided that we would let our Brides make dinner plans from now on and we would just do the flying. We miss getting together with our flying friends. 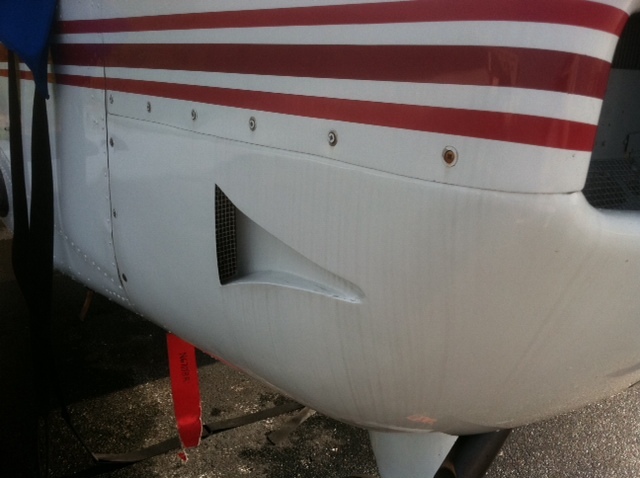 After I drooled on Bob's Mooney, wow, what a panel!, I decided to head south. We launched for home and made good time riding the tail wind. Wilmington had us land on runway nine and it was a short taxi to our tie down. We secured the plane and headed for home. I made a stop for pet food and now here I sit typing this out. Yikes! it's just about 5:30 and I have to shower and change for a graduation dinner tonight. Pictures taken with iPhone, I left the camera in the baggage area. I may be flying tomorrow, Georgetown for breakfast! Mary and I purchased a 2001 VW Cabrio for an airport beach car. Mary did not feel up for the 1.5 hour drive in heavy traffic to bring the car home so I had to make other arrangements. 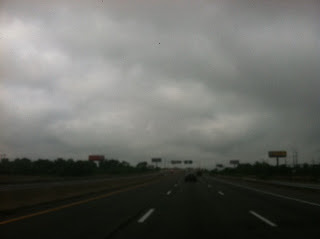 I sent a text to Mike B (our caped crusader), yes he is our hero, he stepped up and offered me a ride to Doylestown (KDYL). 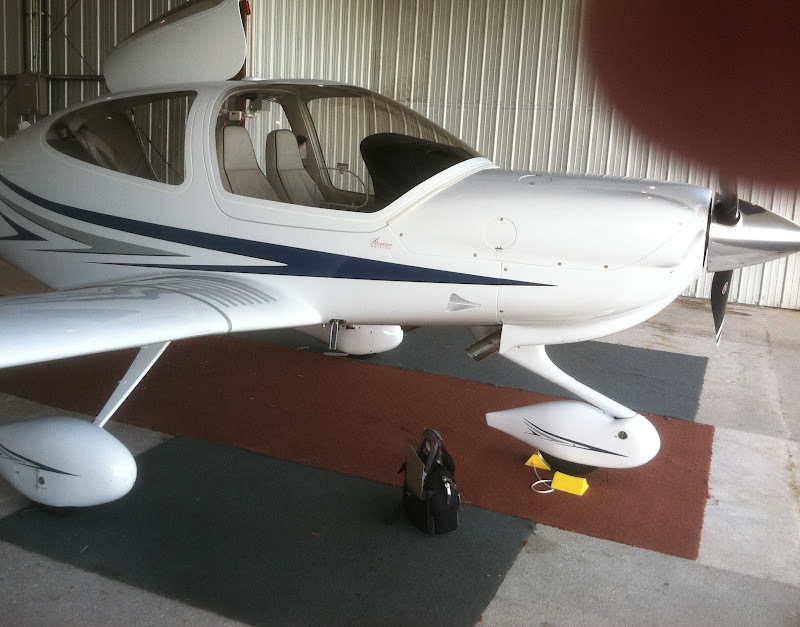 Now Mike usually flies our Sundowner although he also flies a twin Comanche with Frank and a Diamond DA40. Mike and I caught up at the west T's and I followed along as he completed the pre-flight. We were good to go with the TFR and taxied out for launch. The Diamond Star had good acceleration and was wheels up by 60 knots. This was my first flight in a Diamond and I must say the view is awesome. The glass panel is distracting for me but Mike was rolling through screens chuggin and pluggin. The aircraft really hustles along. 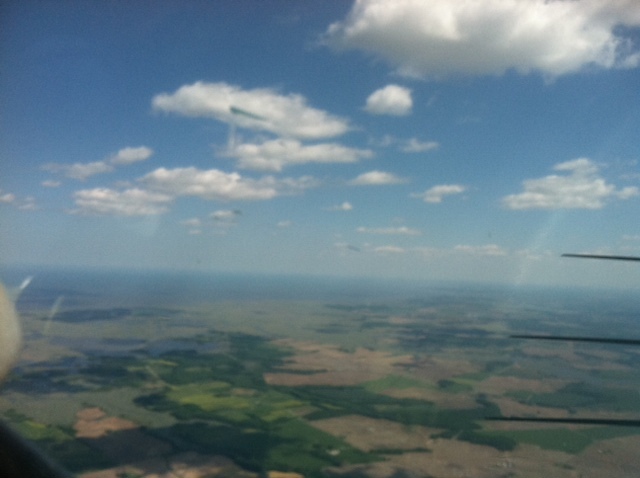 We saw speeds around 135 knots and Mike typically plans for 140. It took a bit to get used to the long wing but the view just in front of the wing was very good. The leading edge was about in line with my hips. The seating was a bit tighter than my Sundowner and the center stick makes it tight but requires your attention. 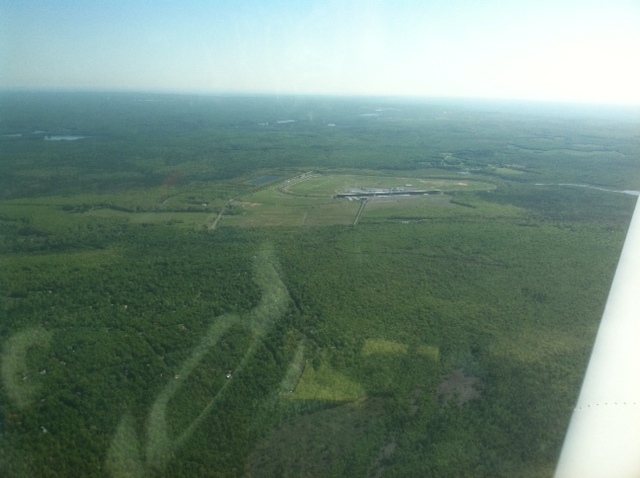 Mike shot the GPS RWY 5 approach and finished it off with a super smooth landing. 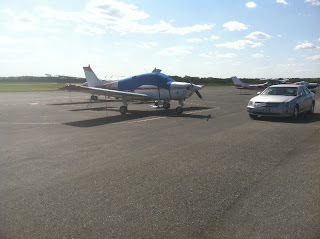 A great use of flying saved me a couple hours of driving and made for a fun time in a new to me plane. Mary and I met up at Red Eagle so we could finally start flying to the beach. Mary was running a few minutes behind schedule due to a minor fender bender at a red light. No damage to either vehicle so all is well. By the time Mary pulled into the lot I was ready to help with the few bags and Maggie. I had completed the preflight so 08R was ready. Maggie loaded through the baggage door and surveyed the situation. She quickly settled and found her spot, curling up and getting comfy. I had filed last night and picked up my clearance with Wilmington ground. Today's route ILG DQO ENO EZIZI KOXB. Altitude 2000 expect 6000 in ten minutes, Philly approach 119.75 and my squawk code. The winds were off the nose thirty degrees and gusting. It was a crab at runway heading along with a bronco ride to two thousand. Philly cleared me to four thousand and advised final altitude. Rental Caddy, time for the beach! I was handed off to Dover as Mary nodded off and Maggie shifted position now tucking her head between our front seats. 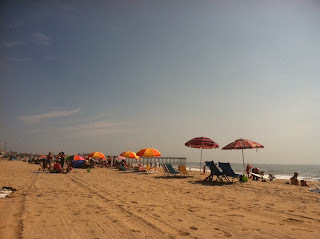 The turbulence never settled and as we let down for ocean city it actually kicked us around pretty good. 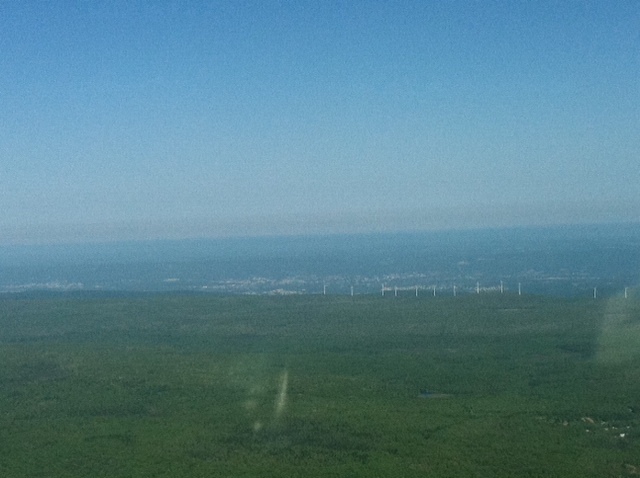 I canceled shortly after being handed off to patuxent and made my ten mile call for OXB. A nice landing and taxi to the ramp for the start of a beach weekend. Mary and I got a call this morning from her brother that her Mom was being admitted to the hospital. She has a cut on her leg and now it's not healing. The doctor is afraid the infection may enter the blood stream so he is going to get her in ASAP. We closed up the motor home this morning and headed back to the airport. 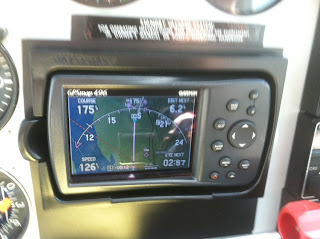 It was a 45 minute trip home with a 5-10 knot headwind and yes, an airmet Tango to make it entertaining. 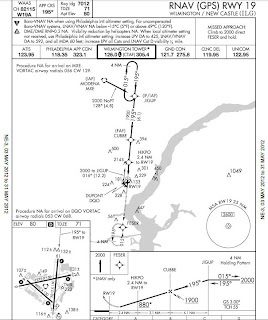 With a call to Philly clearance delivery I was held for release due to that very same TFR. Hmmmm, maybe I should have gotten that pop up. 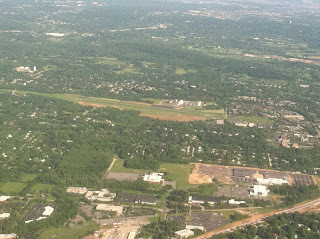 I was only held for a few minutes and was soon departing runway two niner at Chester County. I was cleared to three thousand direct Modena (MXE) and navigated there. 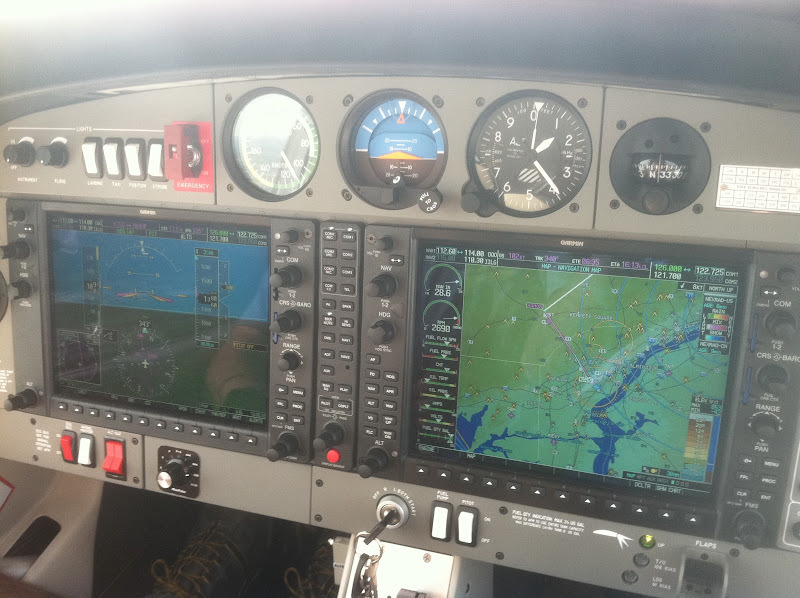 I was told to expect the GPS 19 into Wilmington and I chugged and plugged on my Garmin 530 so I was ready to activate. As I was about to cross MXE I was handed off to another section for control. 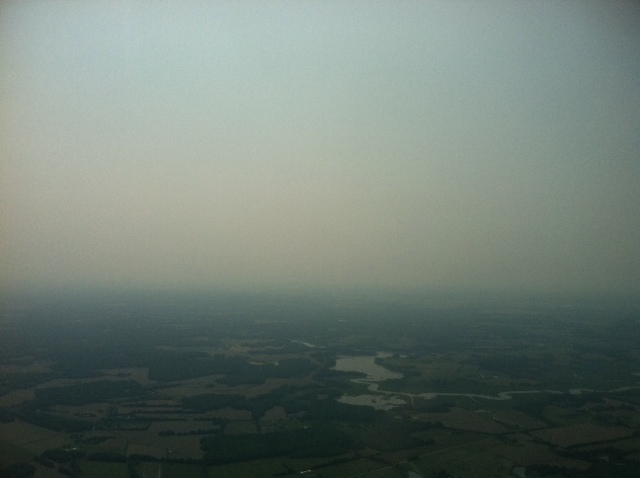 I contacted the new control advising 3000 level with ATIS (wx info) at Wilmington. As I crossed MXE I was cleared for the GPS 19 and handed over to the Wilmington tower, given the wrong frequency, but I questioned control and he corrected. The odd part was he never stepped me down to two thousand feet as noted on the plate. I proceeded to JIGUP at three and started my descent to one thousand nine hundred and drove on to CUBBE. 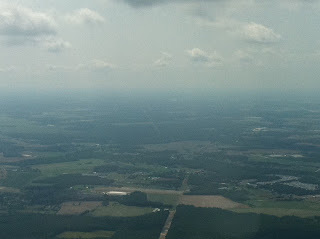 From this point I was spot on with altitude and course flying through some cloud cover. Once inside CUBBE the tower advised there was another aircraft on the approach just 3 miles in front of me, I never saw the Cessna. I slowed to match his approach speed and keep the spacing. 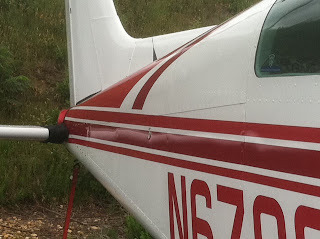 The Cessna was low approach only and I was a full stop. Strange approach but it all works out. An early start to the day, day off that is, so I could get to Cecil Aero for service. I also figured if I got done early I just might beat the TFR at KILG starting at 10:45 local time. 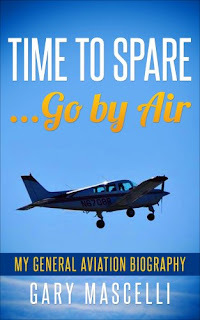 I took my time and did a detailed pre-flight and was ready to climb aboard by 7:30. 08Romeo started up like she new she was going to visit Roger for service, maybe two blades and a quick start with a smooth purr like idle. Maybe all the attention this past weekend has me back in good graces. I was up and out of Wilmington airspace pointed to the top of the Chesapeake Bay, the Elk river to be exact. A cloud layer was hanging out just on the Delaware side of the Delaware river but I was clear sailing. 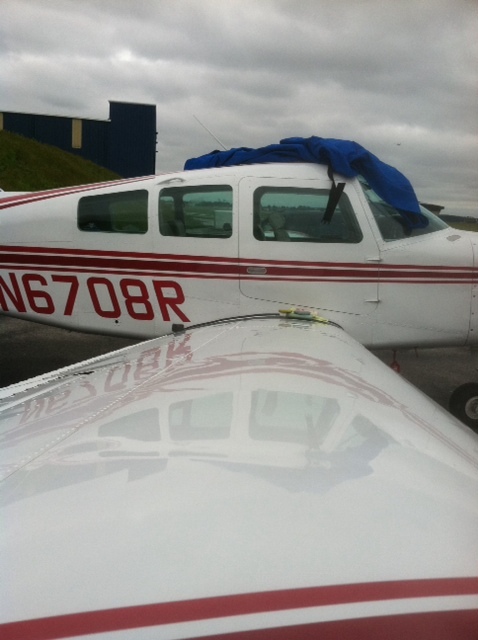 I taxied in and shut down in front of the hangar, ready to get started. The return trip was going to be close. I had switched to the Wilmington tower frequency as I noted the updated ATIS info advising the TFR was active. Oh well, I thought about getting a pop up and started to note my info needed. At the same time another aircraft was turned away due to the TFR and our VP was inbound. I decided to head over to KMQS for a short spell and try to get home after burning some time. I never did shut down, instead I called Philly clearance delivery and filed for Wilmington. It didn't help I still got a ground hold for a few minutes then Philly cut me loose. 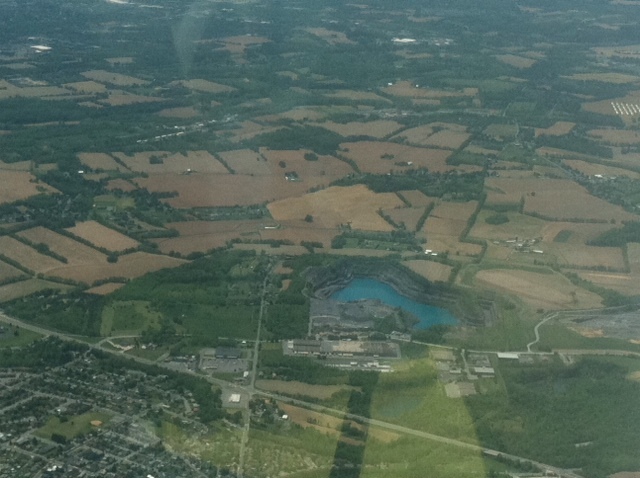 I got my release and was on my way, ending my day with a RNAV GPS 19 approach and some time in the clouds. Just a couple of shots to show the finished shine. 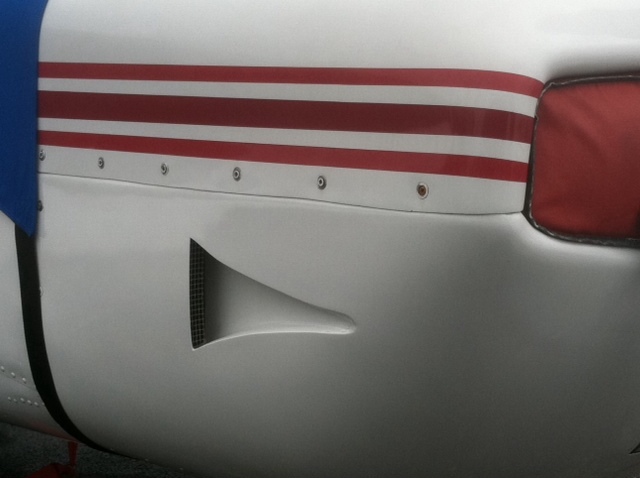 It's a very overcast day but you can clearly see the reflection in the wing and if you look at the red stripe you can see the reflection of the stabilator. I've waxed the plane and my Benz ML320 and I have well over half a bottle left. I'll do Marys C240 this week. 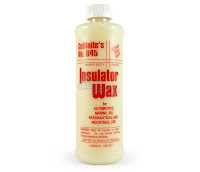 The Collinite product is very easy to use. The extra work for me was the prep. I wanted to use the Zymol cleaner wax to remove any stains. After going out to breakfast this morning I decided to head to the airport and give 08Romeo a bath, she really needed it. 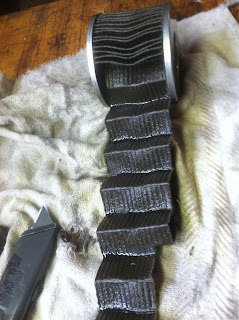 Once the wash was completed and 08Romeo dried off with a microfiber chami I worked on the water stains below the cowl camlocks. I tried a clay bar but that didn't do much, then switched to a cleaner wax that always did a nice job on our cars. 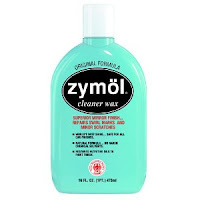 Zymol was recommended by a few pilots on the forums that I read so I went through my cleaning supplies and gave it a try. I will say the smell of the product is really nice. I attacked the stains with the Zymol product and with some added elbow grease the stains vanished. 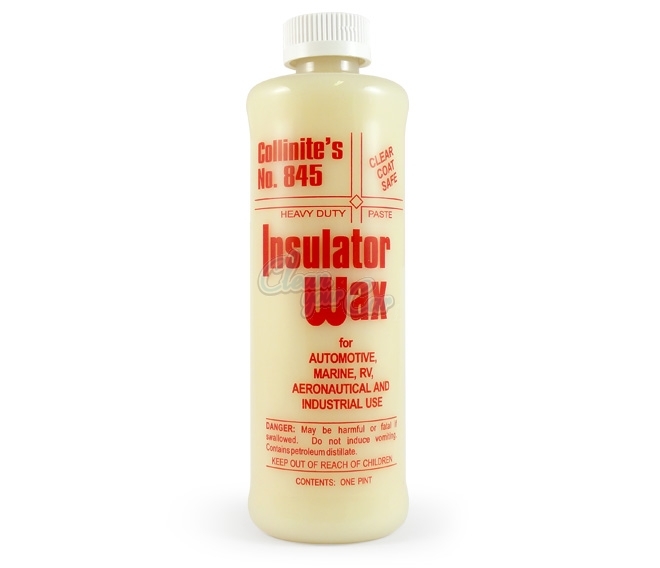 I followed up the cleaning with a new product that was also suggested by fellow pilots, Collinite #845 wax. This product was a bit odd in texture. I followed the directions to shake the container but honestly the texture was like a soft chapstick type of material. I'm not sure giving it a good shake did much at all. I made the call to Cecil Aero and Roger fit me in for Monday morning. I have twelve hours remaining on my oil change but figure with all the beach flying coming up I may as well get it done early. 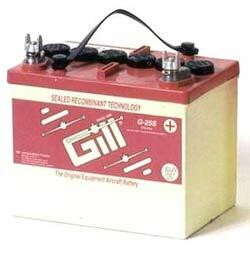 While I'm getting the oil change done and getting my oil sample for Blackstone lab I'll install my two new Gill G-25S sealed batteries. I don't have any other squawks on 08Romeo that need attention. I would still like to get my avionics upgrade completed but that's on hold until Mary's medical condition sorts itself out. 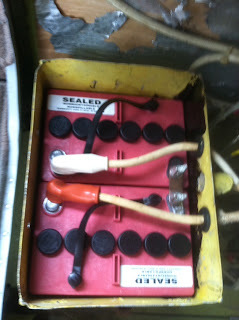 I hope to post a few pictures of the battery swap out and add a few shots of my day flying after the work is completed.